different factors during the processing. The first thing that the producer has to determine is the quality of the incoming product. From this “starting point” adjustments in the processing can be made to produce a consistent product. As with most food products, controlling the texture rice takes constant manipulation of the processing controls to produce a product that is not only consistent, but also up to quality standards. 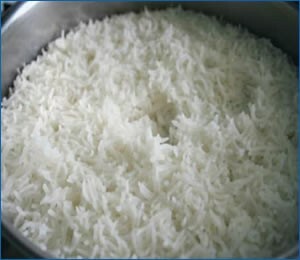 Changes in the incoming raw ingredients are especially important with rice. Different rice breeds along with variations in harvesting can greatly affect the protein and carbohydrate levels in product. 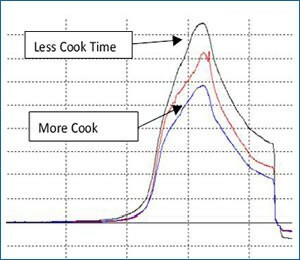 These two characteristics have a great deal of influence on the final texture of the rice. Prior to testing, raw rice was cooked using a standard method, drained, and then allowed to cool for a specific time. Rice was then spooned into the CS-2 Thin Blade Shear Cell until cell was full but not packed. The CS-2 cell is based on the design of Kramer Shear Cell. The difference is that it has more blades, closer together. This design is especially helpful when testing small particles like rice, as the pieces tend to fall through the regular shear cell. All testing was done using the TM-2 Shear Press at a speed of approximately 90 mm/min. The peak force values from this test are an indication of the firmness of the product. 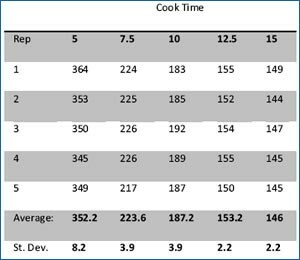 This gives the processor valuable information about the product that they can relate back to things like proper cook time, soak time, etc.